The international break may have come at the perfect time for the Clarets with just one point collected from four Premier League fixtures. Following the goalless draw on the opening weekend against Southampton at St Mary's, Burnley have lost to Watford, Fulham and now Manchester United with the remnants of their Europa League exit still being swept to one side. Romelu Lukaku did the damage on this occasion, scoring two first half goals, as United cruised to victory on Sunday. Worryingly, Sean Dyche's side are unrecognisable at present - both systematically and functionally - from the auxhillary that had protected their goal so well last season. Yes, this was Manchester United, a club that has spent hundreds of millions on its playing squad during Jose Mourinho's reign. But it is becoming a common occurrence. And it's not just the back four and Joe Hart. The issue stems from the front, a domino effect from a system that just doesn't appear to be suiting. The ball simply isn't sticking with the one man up front, the press doesn't seem to be as intense or energetic, the shape isn't as refined, nor the movement as synchronised, and there are holes all over the pitch. This, though, could be the break that they have desired. It's a chance for the likes of long term absentees Robbie Brady and Steven Defour to move closer to fitness while Johann Berg Gudmundsson and Stephen Ward can recover from knocks. It was incredibly uncharacteristic that Lukaku, the scorer of both of United's goals, had so much space to exploit on both occasions at Turf Moor. 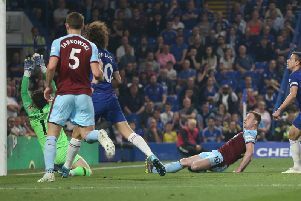 Nobody was in the vicinity of the Belgian striker when he peeled off Ben Mee to beat Hart to Alexis Sanchez's cross in the 27th minute and the former Everton forward was completely unmanned just before the interval, although the hosts were struck with a huge chunk of misfortune. It was all one way traffic in the first half as the Clarets to get a foothold in the game. United, on the other hand, moved the ball well and got numbers forward. Jesse Lingard whipped the ball beyond the upright from the edge of the box as former United youngster Dwight McNeil, on his full Premier League debut, obscured Hart's vision. The former Manchester City stopper had a much better view of Lingard's next attempt but he had to re-adjust his body to palm the ball to safety after the midfielder's flick caught James Tarkowski's boot. Lingard went for a less glamorous approach with his next attempt at goal, opting for placement, but he was well off target on this occasion. The breakthrough came just before the half hour and, just like both goals scored by Alexandre Mitrovic at Craven Cottage, it was unavoidable. Neither Mee or Charlie Taylor got close enough to Lukaku when Sanchez supplied the cross and, reacting to it before Hart, the striker placed his header in to the back of the net. There are not many occasions where Burnley have found it hard to contain the opposition on home turf, but this was one of them. United were quick on the counter, Lingard, Sanchez and Lukaku all combining well, and it was the latter who was denied his second when Hart raced off his line to narrow the angle and block from close range. However, Lukaku struck at the most inconvenient time for the Clarets. With just seconds of the half remaining the striker tucked the ball home under no pressure after Lingard's attempt had ricocheted off Taylor and Ashley Westwood. The home side gave the opposition more to think about after the interval, switching to 4-4-2 as Sam Vokes replaced Jeff Hendrick, but it was United who looked the more likely to add to their tally. Paul Pogba may regret his overly-exaggerated run up after being denied by Hart from the spot. The Frenchman, a World Cup winner, didn't have one of his finer moments when delaying his approach - once Aaron Lennon had tripped substitute Marcus Rashford - only to be denied by Hart, who stooped to his right hand side to save. United were then reduced to 10 men when, in a fit of rage, Rashford reacted to a challenge from Phil Bardsley, and was given his marching orders by referee Jonathan Moss for violent conduct. Hart denied Lukaku again as a hat-trick seemed to be getting further and further away from him before Mee made a superb recovery to thwart the striker again. Lukaku, with the goal at his mercy after taking the ball around Hart, was about to apply the finishing touches before the centre back blocked his route impeccably. The hosts did have a couple of chances to affect the scoreline at the end as David De Gea saved twice from a couple of Vokes headers while Matej Vydra, who got off the mark on Thursday night, headed Westwood's cross wide of the near post.